Austerity implies a cut in government spending during a period of weak economic growth. It is a deflationary fiscal policy, associated with lower rates of economic growth and higher unemployment. Some economists argue ‘austerity’ is necessary to reduce budget deficits, and cutting government spending is compatible with improving the long-term economic performance of the economy. 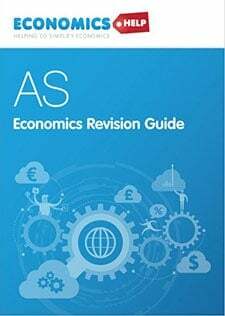 However, Keynesian economists argue that, in a recession, austerity can be ‘self-defeating’ with spending cuts causing a fall in aggregate demand, leading to lower economic growth. This leads to lower tax revenue and can offset the improvement from spending cuts. Budget deficits are too high and need to be reduced. After 2009 recession, many European and US economies faced record levels of peace-time deficit. 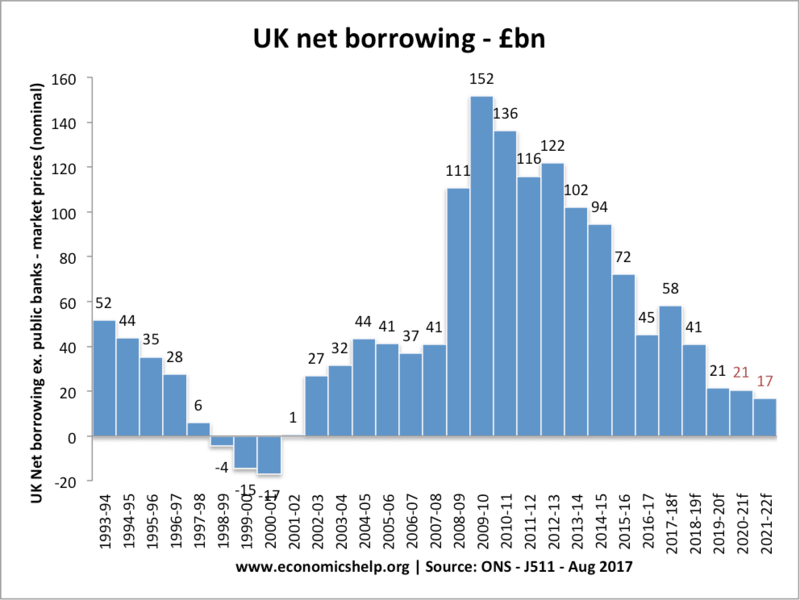 The UK budget deficit was over 10% of GDP, causing a rise in national debt. Bond yields. If budget deficits are not cut, it can lead to higher bond yields (e.g. in case of Greece, Spain and Ireland). EU Bond yields rise in the aftermath of higher borrowing levels 2010. Higher bond yields and interest rates on other bonds can reduce private investment. Confidence. Cutting budget deficits will give investors greater confidence about the long-term performance of the economy. Lower debt levels will encourage the private sector to invest. In 2012, the EU commission produced a report saying that austerity measures are working to reduce budget deficits. José Manuel Barroso, the commission president, said: ‘I can say the medicine is beginning to work’ (Economist). The EU point to falling deficits in countries such as Estonia, Finland, Luxembourg and Sweden. Hungary has also improved its fiscal position. The morality that the government shouldn’t be spending money, they don’t have. Liquidity trap. In a recession and liquidity trap, there is a rise in private sector saving and therefore strong demand for government bonds. Despite the rise in UK and US deficits, bond yields have continued to fall – suggesting that there is no immediate need to cut spending in a recession. The fear of rising bond yields in UK and US is misplaced. Maintain demand. In a recession, you have the private sector paying off debt (leading to lower private sector consumption and investment) This leads to a fall in aggregate demand. If the government also cuts spending then there will be an even bigger fall in demand. Keynesian economics suggests in a liquidity trap, we should increase government spending to offset the fall in private sector spending. Low bond yields. 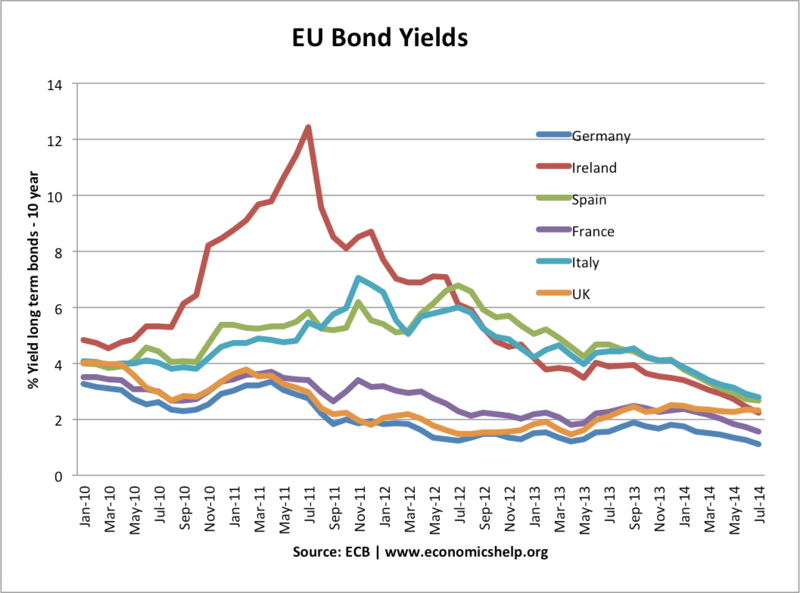 Higher bond yields in Greece, Spain and Ireland are due to the problems inherent in the Eurozone – i.e. no lender of last resort. A better way of dealing with rising bond yields would be through common Euro bond and full fiscal union – cutting spending doesn’t help. Austerity measures in Greece, Spain and Ireland have not stopped rising bond yields. 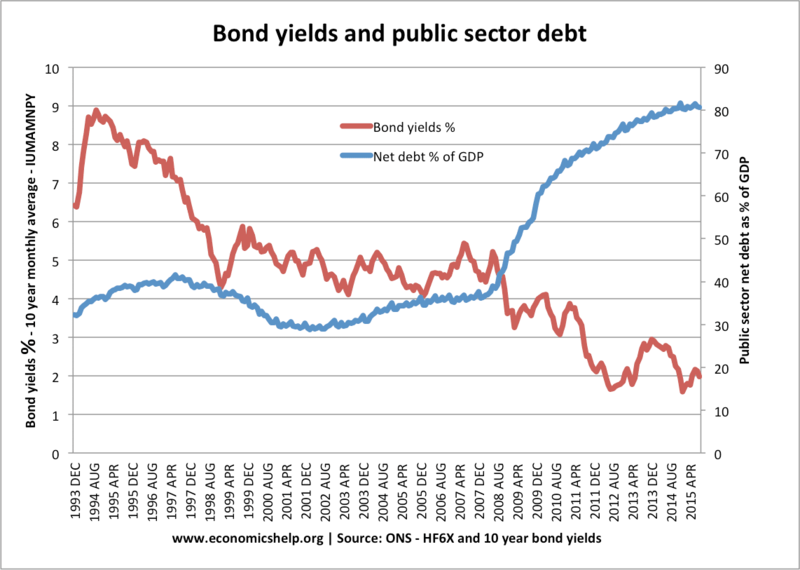 In fact austerity measures have led to higher bond yields. This is because markets see that austerity has caused lower growth and lower tax revenues, therefore, with a shrinking economy markets can’t see how governments can repay. Austerity can be self-defeating. In a recession, governments who cut spending hard, have seen a large fall in nominal GDP. E.g. in 2011, Greece had a fall of 6% in GDP. This has led to a shrinking of tax revenues. Debt to GDP has continued to rise. In other words, austerity has reduced economic growth so much that the budget deficit has failed to improve. A recession is not the time for austerity. Austerity should be pursued when there is strong economic growth. Canada’s deficit reduction was successful because it could loosen monetary policy, devalue exchange rate and benefit from strong export demand to US and rest of world. Many Eurozone economies can’t do this. They can’t devalue, they can’t pursue expansionary monetary policy – they can’t rely on exports to recover – because the whole Eurozone is weak. The problems of the Eurozone is not just about deficits; it is about a lack of competitiveness and misaligned exchange rates. In 2011, Greece had a current account deficit of 10% of GDP – It is fundamentally uncompetitive. Germany, by contrast, has a current account surplus of 6% of GDP. There is no evidence that cutting spending creates increased confidence. In the UK, confidence collapsed after the coalition came into power and this contributed to the double-dip recession. Success stories like Ireland, Estonia and Latvia are dubious. 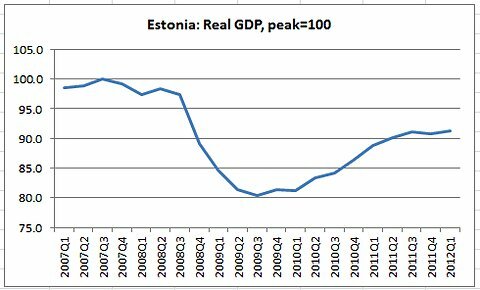 After a 20% fall in GDP, Estonia has seen a rebound, but GDP is still 10% below 2007 peak. Unemployment has been in double figures for the past 4 years. This is not a success story. It didn’t have to be so painful. It is a similar story with Latvia – often praises as a success, but still with unemployment of 15% and GDP below 2007 peak. Why is austerity politically popular? There is a case that the public sector is too big and so there is a need to cut back in that sector. If that is so, it means a reduction in government spending that is not an austerity measure per se, but an attempt to change the economic structure. It is unfortunate it is happening at a time when there is otherwise a good case for fiscal stimulation. Yes, it is a shame government spending as a % of GDP increased during the boom years. The former if left unchecked will end in a debauched and worthless currency. The latter will end if left unchecked by the financial authorities. Market forces will stop it. 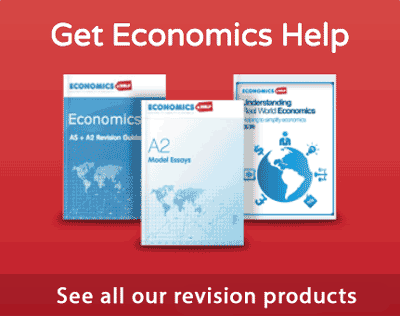 Examples of ii) Great depression –Japan 1990 –Current Economic problems USA UK being 2 examples. Lax monetary policy will feature in all Booms.However that only becomes evident when the Bust starts. Increasing public confidence will precede any and all booms. At the end of a Boom confidence cannot go back to normal. It will always recede to below normal. Recession must follow. The greater the boom the greater the Bust . If a boom is asset price based and relatively small- then reducing interest rates can stave off a recession. However this policy will typically fuel the next Boom. How to Deal with Bust which follows on from an asset based Boom. 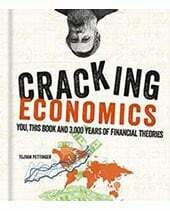 The resulting recession can be limited with a well designed monetary response. Will this response return confidence to normal –No! The micro effect of de –leveraging debt –consumer –corporate –Government will prolong the recession —i.e create Macro negative effects. Unemployment will be the principle negative feature. Definition of taxation –a transfer of purchasing power from providers to recipients. d)	Recipients of dividends relating to public debt. e)	Workers /investors in the private sector that do not supply the public sector. The volume of purchasing power that is transferred is not enough . The balance has to be borrowed. In the present circumstances workers are being transferred from a) b) and e) to be non workers in c) Tax from declining numbers in e ) is reduced . This situation will mean that more tax is given to d) as government borrowing increases. 1)	Create ways for e) to grow. 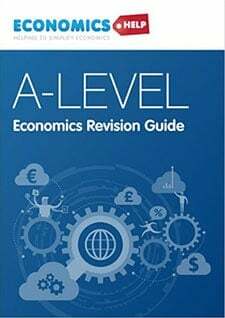 Taxation on b) and e) simply becomes an on cost that has to be matched by higher prices. If this was substantially reduced –in the short term the money saved could just go to the investors. In the medium /long term it will result in lower prices . Market forces ensures this. 2)	Borrow money and give to b) in exchange for the completion of specific infrastructure projects. They say never waste a good recession. Mechanism naturally exist in e) . 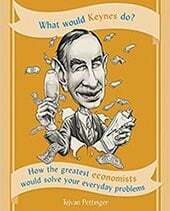 The natural scramble for more income plus a response to preserve the status quo in terms of income tends to efficiency . The public sector adds huge value to the U.K in general –that said no natural mechanism exists for efficiency. The most efficient public sector department is the Highways Agency. The management and technicians are in a) but the work is carried out by b). It is highly competitive . Using that Agency as a model , tax receipts must be transferred from a) to b). Creative leader ship is required to break down attitudes and methodologies to make this happen. More borrowing can be employed to facilitate this and 2) . Bond dividends are very low. There will never be a better time. The impact of strong leadership will inspire. This leadership will increase general confidence generally in the economy.